The convenience of certain appliances in this modern age is certainly appreciable. Some cultures have adopted dishwashers to the extent that they can't do without them. However, the fact remains that regular dishwashers are bulky and cumbersome appliances. That’s why not every person prefers to reserve a large space for a dishwasher. If you’re living in a small apartment, have a tiny kitchen, or even a trailer home, a small dishwasher is the way to go! A small dishwasher will sit on your counter or have a built-in design, providing easy access and efficient energy, especially if you choose from the top ones available. 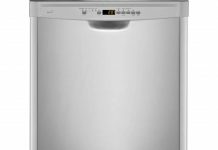 Wondering how to select the best small dishwasher? 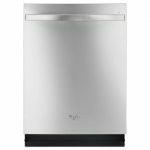 The right information about different the brands of dishwashers available can help you choose the small dishwasher that fulfills your requirements. What Makes a Small Dishwasher Different? The main difference between a normal and small dishwasher is, of course, the size. Modern living spaces can be quite small, so many people are looking for more compact or convenient versions of everything. To this end, a small dishwasher is usually around 18 inches in width rather than the 24 inches you were previously used to. 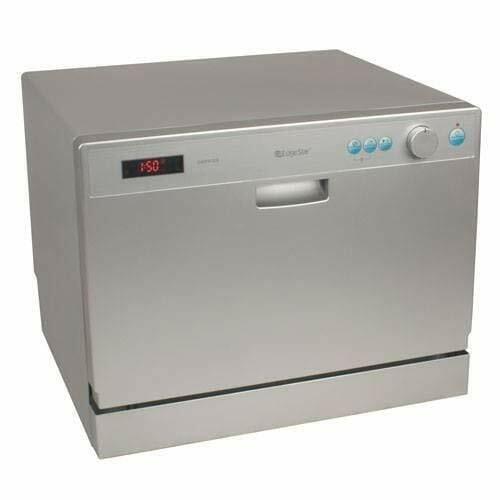 Small dishwashers provide high-heat cleaning, a variety of cycles, full power, and all the other features you look for in such appliances. There should be no compromise in the efficacy and performance of this appliance just because of its size. You may not be able to fit as many dishes in there, but it should be enough for an average family. Such models usually give you the same amount of water pressure and power, providing clean dishes on a regular basis. Another difference here is that small dishwashers come in two kinds: a free-standing version and another with three unfinished sides for easy installation. Regular dishwashers, on the other hand, are usually designed for under-counter installation. A free-standing small dishwasher provides portability and flexibility in its location, which is not a likely option with the regular kind. The main reason for buying a small dishwasher is obviously its space-saving feature. People aren’t just living in houses with full-sized kitchens. They’re also living in RVs, trailers, studio apartments, boats, and dorm rooms. Other places might be more temporary, like an office lunchroom, but still, they require dishwashing facilities on a regular basis. In cases like these, a small dishwasher is often necessary. Small dishwashers also come in handy if a kitchen is already built, but without the space for a regular dishwasher. Some older dishwashers were smaller, so you might want to buy a small version to replace them eventually. Whichever model you choose, if you’re using a dishwasher for the first time, make sure you carry out some essential steps. If you think a small dishwasher is the best option for you, there are some features to consider before making a decision. These could be the difference between an inconvenient model and the perfect one, so be sure to go over them carefully. The materials for a small dishwasher include those on the inside as well as the outside. A stainless steel interior will give you a higher level of durability than the plastic kind. Such dishwashers are also easier to clean and maintain. Write down the dimensions you need for your small dishwasher. Be sure to measure the distance from your countertop and the bottom of your kitchen cabinets if this appliance is going to be on your counter. A small dishwasher should fit into these dimensions comfortably. The dimensions should go hand in hand with the capacity of your options. You should be able to load the daily requirement of your dishes into the small dishwasher. If done wisely, the dishwasher can prove to be cheaper than hand washing. You’ll get different kinds and variations of cycles with the model you choose. These include high-power, high-heat, and other options. See which cycles suit your routine the best and make your decision accordingly. Water and energy consumption determine your monthly bills and your carbon footprint. You hence need to be careful when making a decision based on these criteria. It’s better to invest a little more in a small dishwasher that offers efficient water consumption than to buy one that requires more water and energy, which will result in higher water and electricity bills. A small dishwasher doesn’t require any complicated setup. Even if it does, most models come with their own parts as well as the tools needed for installing them. All you need is a level place to put it, preferably near the sink. Maintaining a small dishwasher is mostly the same as for a regular version. You should clear off any leftovers beforehand and be sure not to overload the racks. The dishes shouldn't hinder the spray arm either. 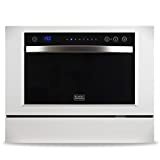 We’ve reviewed the following best small dishwashers of 2018 by looking at reviews, feedback, and ratings online. This process also included researching the features within the models as well as the different conveniences they offer. For this reason, you can be sure of an unbiased variety of options to choose from. 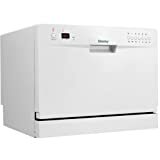 The Danby DDW611WLED is a countertop dishwasher that saves money while doing the dishes. It has a quick-connect adapter that lets you connect it to the sink. The stainless steel interior assures an easy cleanup and high durability. It can handle six place settings in one go, with six kinds of wash cycles installed for proper cleaning. It’s also lighter in weight than most other options, but around 50 pounds. 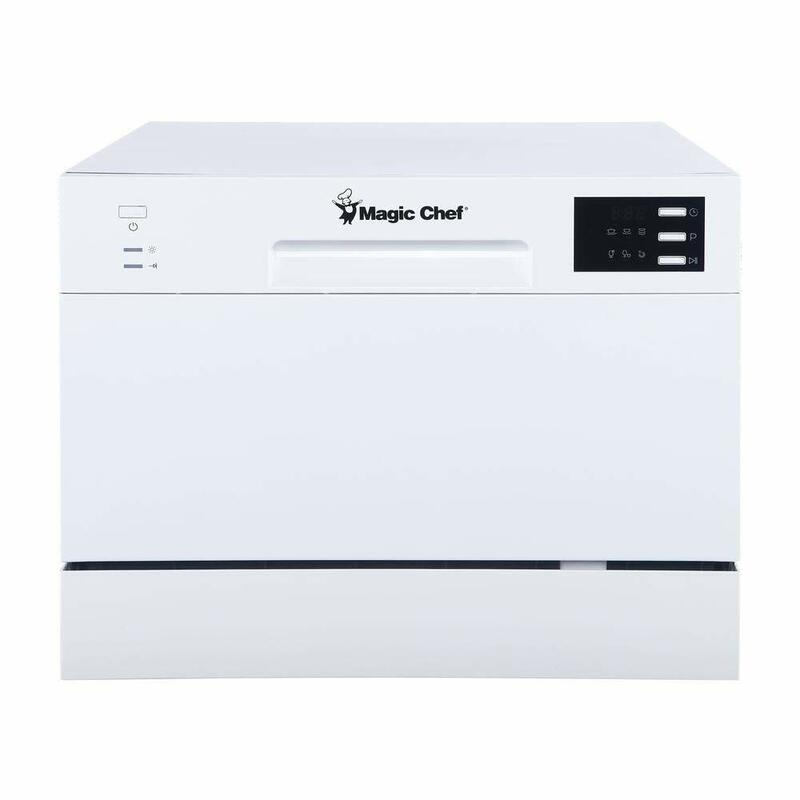 Customers have reported satisfaction with the options and features in this small dishwasher, along with its efficient water and energy consumption. There is, however, a low hum when it runs, so the operation isn’t perfectly silent. This item has an Amazon rating of 4 out of 5 stars. The price range for this dishwasher is between $400 and $500. The Black+Decker BCD6W is Energy Star-certified, has a capacity of up to six place settings, and is a compact, portable small dishwasher. It has a spacious interior that’s made of high-quality stainless steel. Also included are no less than seven washing programs that can get any kind of dishwashing done. The energy saving certification ensures that you’re getting the job done and reducing your carbon footprint at the same time. One unique feature here is the child lock, which parents will surely appreciate. Customers have reviewed this model as being user-friendly with an easy LED control panel. 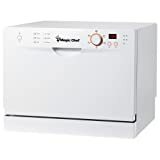 The water and other connections are quick and easy as well, so the dishwasher should start up immediately. This item has an Amazon rating of 3.5 out of 5 stars, and the price range is between $395 and $495. 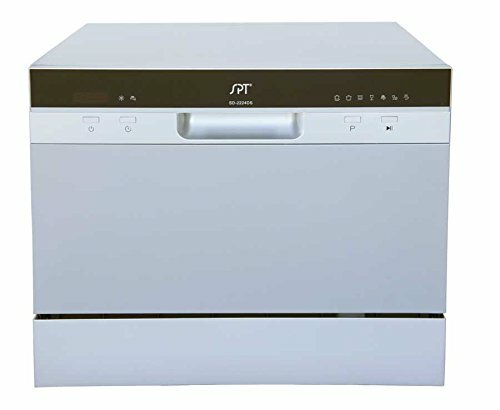 The SPT SD-2202S is a countertop dishwasher with a delay starter. There’s no need to get any special plumbing or installation done with this unit. It can easily connect to any tap. The interior is spacious and able to hold six place settings. 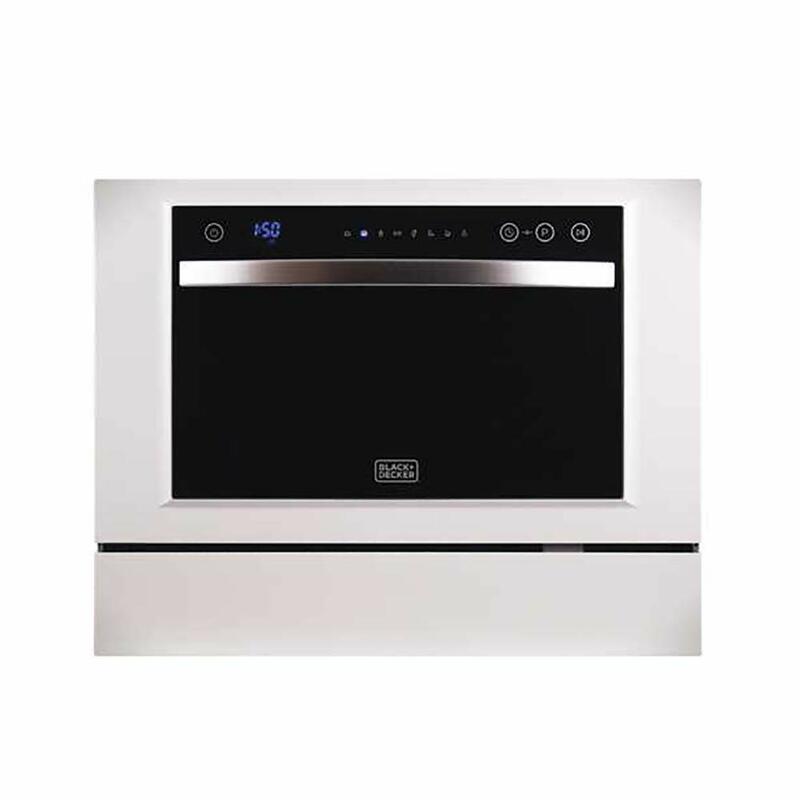 It’s stainless steel on the inside and has a sleek silvery polish on the outside that would suit any modern kitchen. A dish rack and silverware basket will hold your dishes easily, while the automatic detergent dispenser will make things even more convenient. The reviews for this small dishwasher have been mostly positive, with special appreciation for the affordable price and compact design. Many have also found its performance excellent, although the beeping sound might annoy some. However, it can easily be turned off while unloading. This item has an Amazon rating of 3.9 out of 5 stars, and the price range is between $375 and $475. The Koldfront PDW60EB is a countertop dishwasher that can hold up to six place settings. It comes with a convenient cutlery basket and a cup shelf to make organizing dishes easy for you. There’s even a rinse agent dispenser built into it, which can help eliminate any water spotting on your dishes. With the internal water heater, the heavy wash cycle, and the quick connect faucet, you can get your dishes germ-free in no time. It uses around 60 percent less energy than other units of a similar kind. Customers love the durable stainless steel material of this unit as well as the powerful spray arms. What they don’t love is that larger items like pots or pans would need another loading cycle. This small dishwasher has an Amazon rating of 3.8 out of 5 stars, and the price range is between $400 and $500. 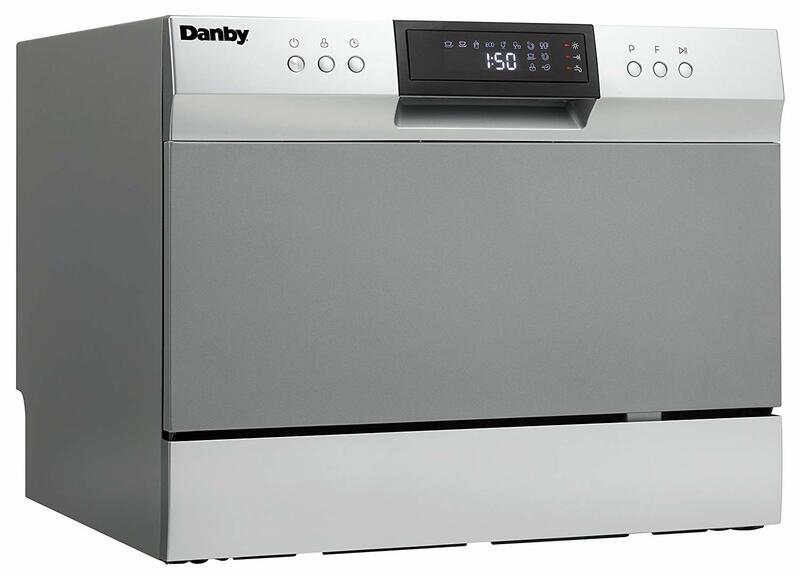 The Danby DDW631SDB comes from a brand that’s renowned for its high-quality compact appliances. With this stylish and sleek option, you can wash all your dishes with just three gallons of water. There’s even a 12-month warranty, which may not be available with every unit. This small dishwasher is around 17 inches in height, the perfect fit for the space between kitchen cabinets and countertops. It’s also easy to clean since the interior and exterior are both stainless steel. You can choose from six wash cycles, including soak, economy, intensive, normal, glass, and rapid. Users of this dishwasher have reported that it can save on energy and water bills, making this investment pay for itself in the long run. They also appreciate the fact that it's quick and easy to install. This item has an Amazon rating of 3.3 out of 5 stars, and the price range is between $265 and $365. 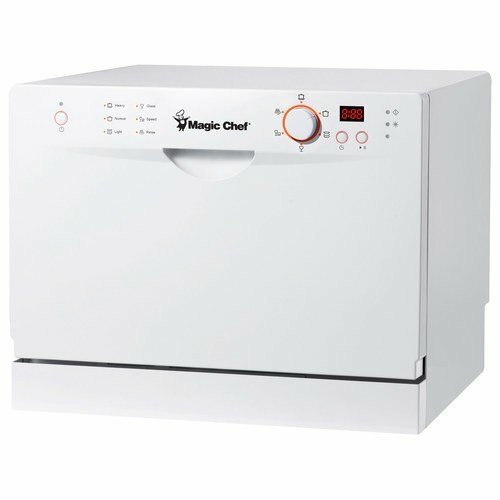 The Magic Chef MCSCD6W3 doesn’t take up a lot of space, but there’s no holding back on its features. It has a basket for the cutlery and a stand for the cups. The drying system is efficient, while the anti-flow mechanism makes sure nothing goes wrong. There are even a rinse and automatic detergent dispenser, both of which would make life very easy for the owner! The water sensor is inbuilt and will ensure your safety no matter what. All these security settings are what set this model apart from other units. The program knob with five-wash settings has pleased many customers. This item has an Amazon rating of 4.2 out of 5 stars, and the price range is between $220 and $330. 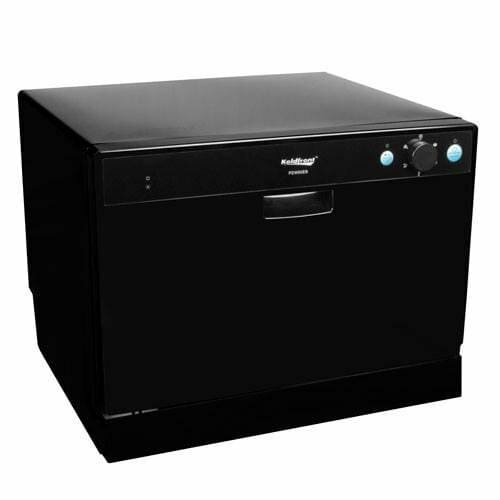 The SPT SD-2213W is a countertop dishwasher that’s especially suited for tiny kitchens, apartments, or staffrooms. It’s still quite spacious inside, being able to fit around six-place settings at the same time. The water temperature can go up to a decent 148 degrees. It’s around 17 inches in height, which makes it able to fit onto most countertops. The silver finish makes it a good fit in any contemporary, updated kitchen. The quiet operation makes for a more peaceful experience than with other models. User reviews for this small dishwasher have shown satisfaction with the efficient energy and water consumption. Its quick connect option also makes for easy use. However, it does emit a beeping sound when it’s open. This item has an Amazon rating of 3.7 out of 5 stars, and the price range is between $186 and $290. 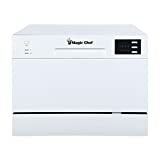 The Magic Chef MCSCD6W5 is a portable countertop dishwasher that can give you all the features of a regular-sized one. It’s perfect for couples, tiny families, single people, or office staff. The electric controls are easy to use since it has a push mechanism. Even more convenient are the cup rack, sliding rack, and silverware basket included. It comes with a delayed start of up to 24 hours. The EZ clean filter is removable, which is a convenience that most units may not have. 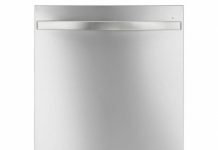 Customers love the modern designer look of this small dishwasher along with the six washing programs offered. These are easily monitored with the LED control and display. This item has an Amazon rating of 4.2 out of 5 stars. The price range is between $263 and $363. 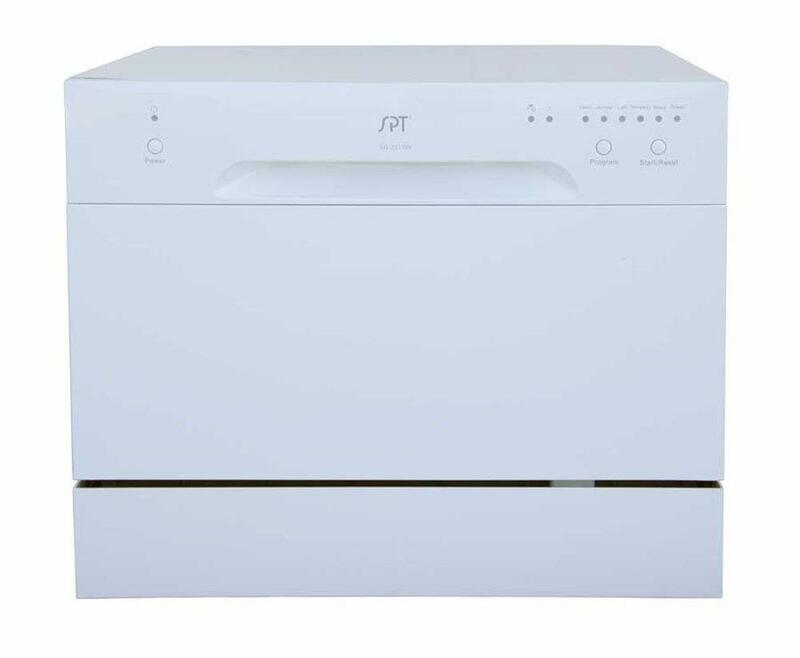 The SPT SD-2224DS is a countertop dishwasher with delay start and an LED display. It measures 17.24 inches in height, which will make it fit comfortably between standard kitchen countertops and cabinets. It can connect quickly and directly to your kitchen faucet, eliminating the need for any special plumbing system. The LED display will show you how much time is left in the cycle and the washing stage at the moment. Customers find the delay start feature especially helpful since it can help them start the cycle when they wish. There’s a warning indicator for water supply and rinsing. However, this unit is bulkier than most other options. This item has an Amazon rating of 3.9 out of 5 stars, and the price range is between $250 and $350. 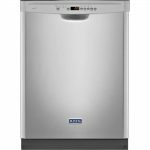 The Sunbeam DWSB3602GBB is a portable countertop dishwasher that you can place on any standard kitchen counter underneath the cabinets. It can deal with around six-place settings at a time. Since it’s portable, you can even take it into any rented room or apartment and pack it up when it’s time to leave. A faucet adapter is included, so you can quickly attach it to your tap and start your washing. The rinse aid dispenser, cup shelf, and cutlery basket help in organizing the dirty dishes. Users have loved the easy LED display here along with the warning lights for water failure, rinsing, and cycle end. This item has an Amazon rating of 5 out of 5 stars. The price range for this dishwasher is between $250 and $350. The dishwashers above have similar features and settings, but the feedback and ratings help us decide which one is the best. 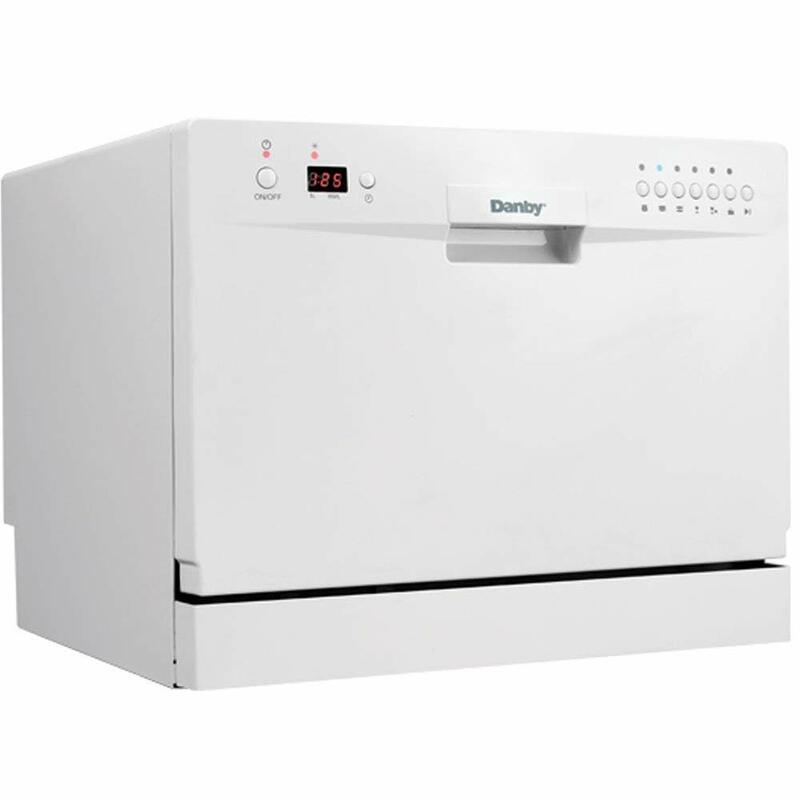 You’ll have to look at the specifications before making a final decision, but the warranty on the Danby DDW631SDB is reason enough to give it special consideration. 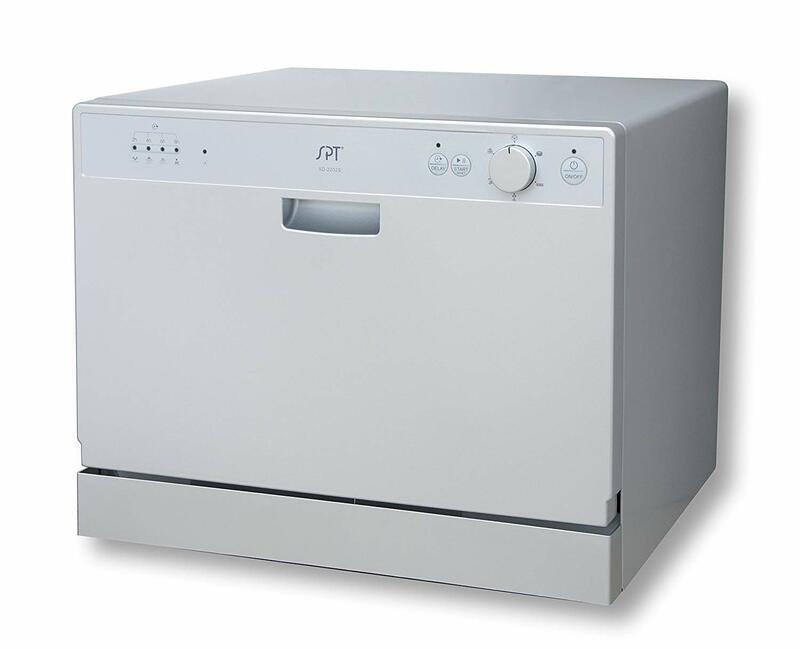 If you’re looking for economy above all, the SPT SD-2213W has one of the lowest prices of the best small dishwashers.